I’m always impressed by a bowl of warm and creamy roasted squash soup. This soup is no different: the rich, earthy, subtly sweet flavour of the roasted squash is enhanced by a just-right blend of spices. Adding apple adds an unexpected yet complementary flavour and touch of sweetness to the dish. No matter what time of year you make it, the taste will make you think of fall with its brilliant-hued leaves and crisp weather. Savouring a bowl of this soup is just like snuggling into your favourite cozy knitted sweater. Not only am I impressed by this kind of soup, I’ve also been intimidated by the idea of preparing such a soup. Not anymore! I promise that this recipe will show you how easily you can prepare this sophisticated yet comforting dish. It might surprise you to know that in the Golden Graham household, Mr. Golden Graham is responsible for the grocery shopping on a weekly basis. And no, it’s not surprising because it’s a reversal on traditional gender roles in the household (I’m not THAT antiquated, people!) – it’s surprising because I’m the “food blogger”, for gosh sakes! But Mr. Golden Graham deserves a LOT of credit for taking on this IMPORTANT responsibility for the Golden Graham household (we LIKE to eat AND of course, as a “food blogger” – there I go, throwing that moniker around again, always with quotation marks, and if you could see me, “air-quote” fingers because I don’t feel as though I’ve truly earned the title as of yet – high-quality, fresh ingredients are of the utmost importance to me). Plus, he has been the one to figure out just which Korean markets and grocery stores carry which hard-to-find (hard-to-find in Korea, that is) ingredients, produce and meats. Meats & seafood come from Costco. Squash, potatoes, onions, broccoli and bell peppers come from HomePlus (a British grocery chain featuring Tesco brand products, for the uninitiated) but we can only find avocados at Costco. Greek yogurt and cheeses come from Costco but skim milk comes from HomePlus. Either store stocks apples, oranges, strawberries, bananas and pre-mixed salad (boxed at Costco / bagged at HomePlus). Confused yet? My contribution to this whole exercise is writing up the grocery lists for each store and boy oh boy, do I ever hear about it if I request something from one particular store that is usually carried at the other! “Honey – how many times do I have to TELL YOU – pre-cut squash is at Costco, whole squash is at HomePlus!” Yeesh. 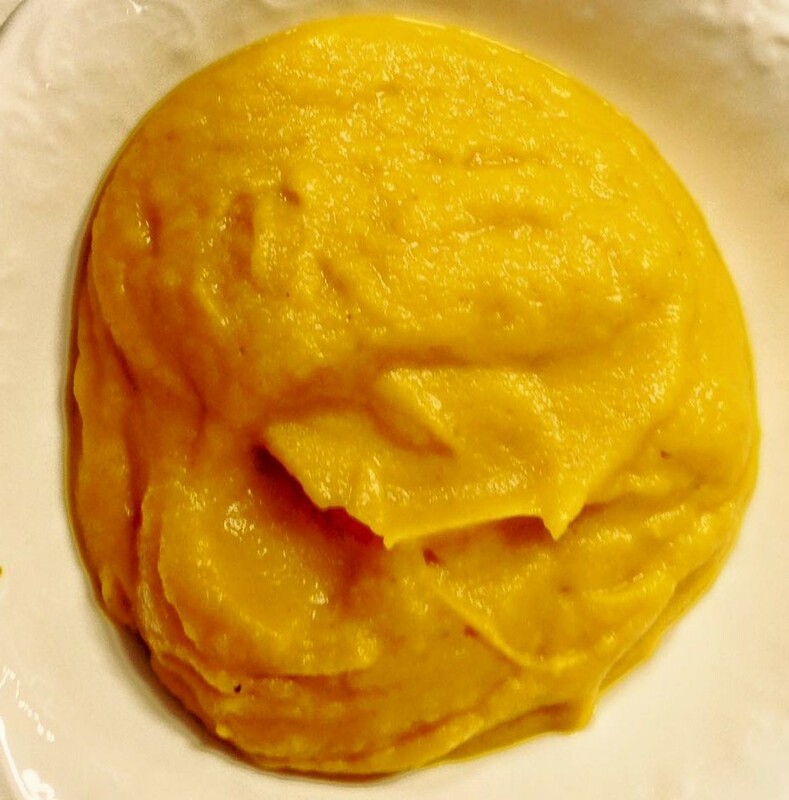 So, the other day when I requested some squash to use in either my own recipe or one of the recipes abounding from my favourite food bloggers (no quotations needed there – these are people I consider to be the “real deal”), I didn’t know what to expect. I certainly didn’t expect the orange-skinned beauty I ended up with! The produce sticker affixed had the unpretentious title “Orange Squash. Product of New Zealand” but I don’t necessarily trust the English-language labels and stickers affixed to Korean foodstuffs. At any rate, I couldn’t find “orange” listed as a true squash variety on Google – do any of YOU know whether the Orange Squash is a true winter squash in the “other” land Down Under? The closest I could find was that it might be an orange Kabocha squash, although that is usually a Japanese variety with green skin. So, really, any winter squash with orange flesh (or any squash YOU like, really) will do in this recipe. Whatever the name, the squash roasted beautifullly and as soon as it came out of the oven I just knew it needed to be made into soup. (P.S. – roasting squash is NOT hard so don’t be scared! Instructions are below, but all you need to do is cut it in half, scoop out the seeds and “guts”, rub it with a little bit of oil and put it on a baking sheet lined with parchment paper and let your oven do the rest. See – not so bad! And if you “over-roast” it, all the better for soft soup texture!) I didn’t feel like prepping any other “savoury” ingredients that you might normally find in a squash soup (like garlic or onion) but I *did* have a jar of my own homemade applesauce (thanks, Vitamix! – nope, not a sponsor – yet! – but I do LOVE my blender) in the fridge and decided to throw that in. 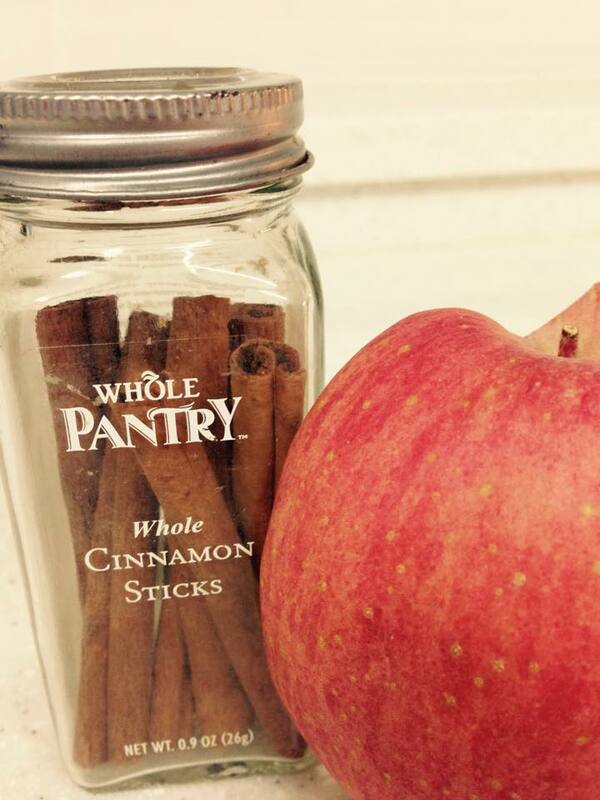 And of course, whenever I’m working with apple, I’m automatically working with cinnamon, too. Some nutmeg and ginger and sea salt to round it out, and I called it magnificent! I also realized I needed a liquid to thin it out to “soup” consistency vs. pudding and unsweetened almond milk was the perfect choice to add creaminess but keep it not only dairy-free but also PALEO. That’s right, people: Paleo soup is on my blog. Rejoice! A perfect pairing – remember these two? The rich, earthy, subtly sweet flavour of roasted squash is enhanced by a just-right blend of spices and paired with apples in a sophisticated yet simple soup. 1. Preheat oven to 325F (165C). 3. 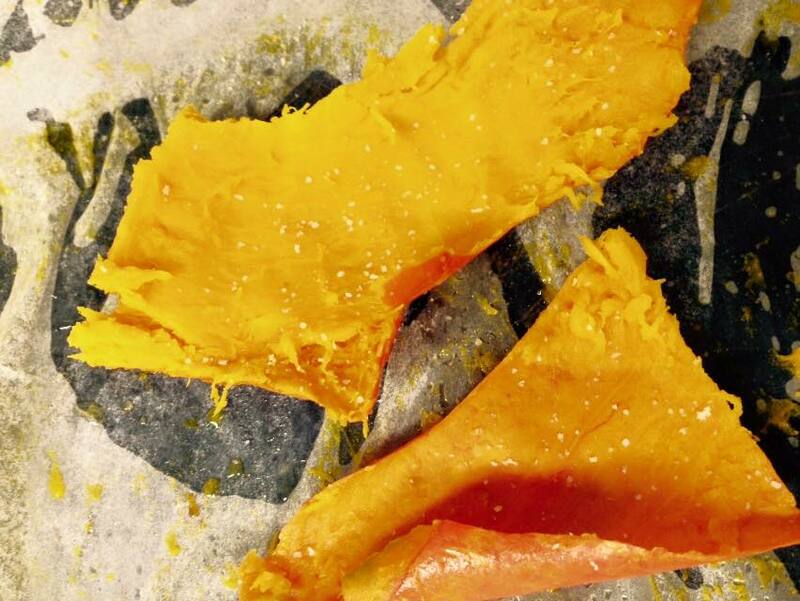 Cut the squash in half and scoop out the seeds and any stringy pieces of squash flesh. 4. Rub or brush each half with 1 tsp of coconut oil and place cut side down on the parchment paper. 5. Roast in the oven for 35-45 minutes until the skin can be easily pierced with a fork and the flesh is soft. 6. Let cool on pan for a few minutes until hot squash can be handled safely. 1. Scoop the roasted squash out of the skin with a spoon (use caution when handling the hot squash) into a high-speed blender (like a Vitamix) or food processor. 2. Add remaining ingredients except almond milk and process until smooth. Be sure the lid is secured firmly so that the hot liquid does not splash out. 3. Slowly add almond milk until desired consistency is reached. 4. Serve immediately or refrigerate and re-heat as needed. This soup can also be served chilled. No matter what time of year you prepare this soup, the warm and comforting flavours will instantly transport you to a cozy fall day. Enjoy as a simple lunch or as a starter or side dish – pairs beautifully with pork dishes. 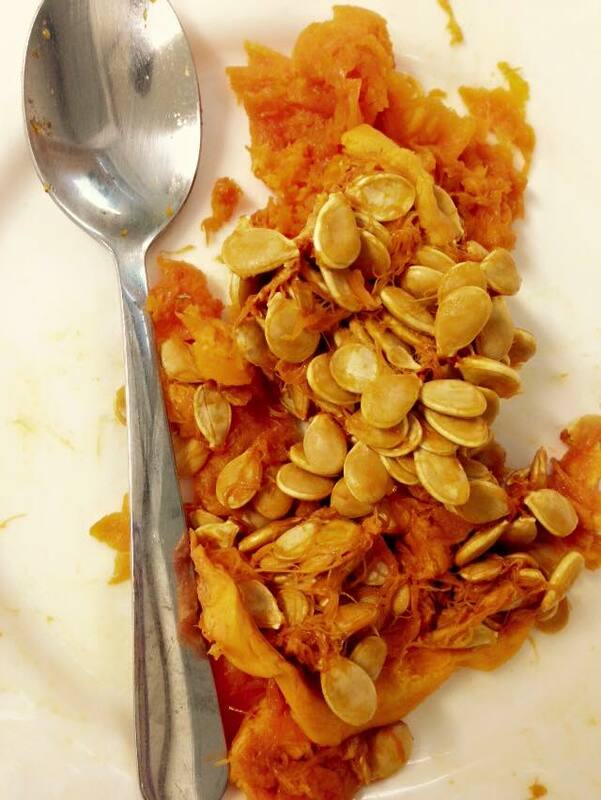 Scoop out the “guts” – some varieties of squash have seeds that are great for roasting! 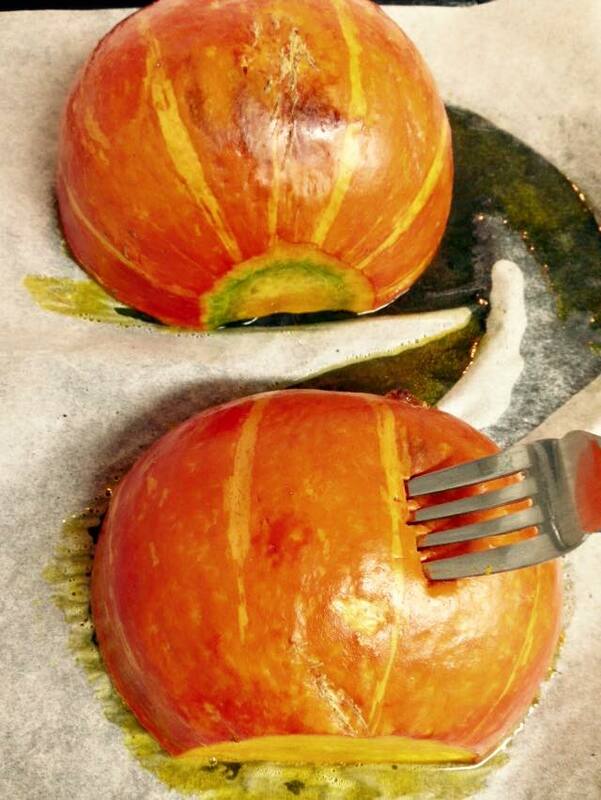 The squash is roasted when the skin can be easily pierced with a fork and the flesh is tender. The skin (or peel) IS edible and a good source of fiber – I like to cut it into strips and enjoy with some sea salt. 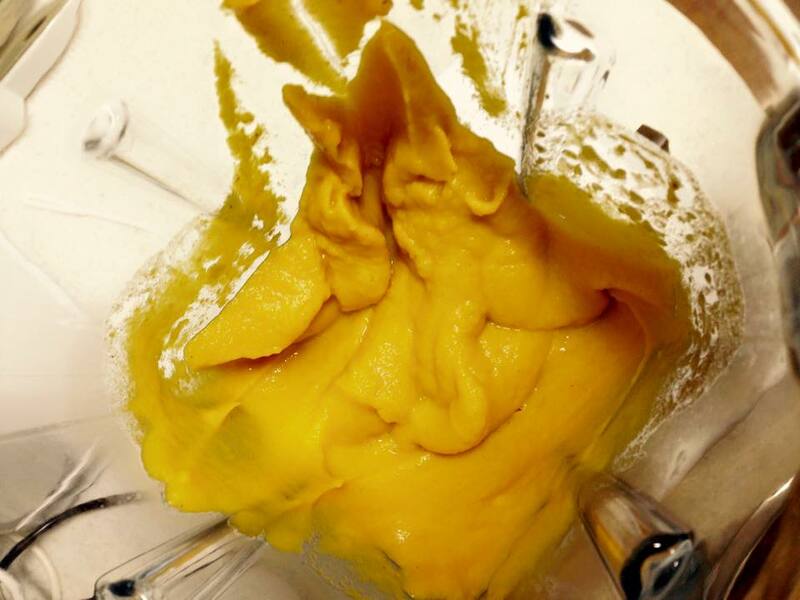 First pass in the blender – add almond milk or other liquid of choice (dairy milk, water, chicken or vegetable broth) to thin to desired consistency. Would you be shocked to discover that I (of all people) LOVE squash soup? This is something I will definitely be trying! Not at all! And to make it even more insanely easy, you can either buy a jar of unsweetened applesauce OR a snack-pack of Mott’s unsweetened applesauce fruit cups (1 little fruit cup is usually half a cup) to use in the recipe, and then you have the rest for healthy snacks (or to make the recipe again…and again!). Also, you can use olive oil if you don’t have coconut oil on hand. I suppose I don’t need to worry about ingredient availability with you of all people, though! Let me know how it goes!